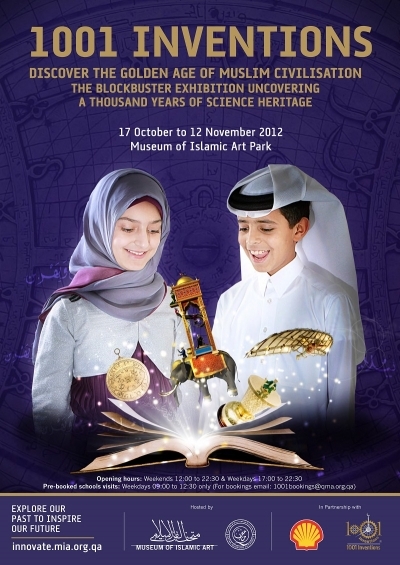 Doha, 16th October 2012: The award-winning 1001 Inventions exhibition, and its sister show Arabick Roots, enjoyed a Royal launch in Doha’s Museum of Islamic Art, thanks to Her Excellency Sheikha Mayassa bint Hamad bin Khalifa Al Thani who officially opened both exhibitions today. At the event, attended by 500 distinguished members of the local and international cultural communities, guests were led through the exhibition on a journey to the Golden Age of Muslim Civilization in a memorable celebration of modern science’s heritage. Sheikha Mayassa, who is Chairman of the Board of Trustees of Qatar Museum Authority, was given guided exhibition tours by Ahmed Salim, Producer and Director of 1001 Inventions, and Dr. Rim Turkmani, Curator of Arabick Roots. 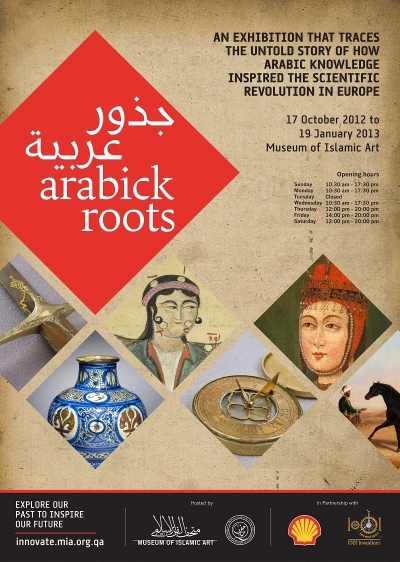 Connected by the theme: “Explore our past to inspire our future,” the two exhibitions will be open to the public from the 17th of October 2012, with 1001 Inventions running until 12th November and Arabick Roots continuing until January 2013. “Muslim civilization stretched from southern Spain as far as China, and for a thousand years, scholars of many faiths built on the ancient knowledge of the Egyptians, Greeks and Romans, making breakthroughs that helped pave the way for the Renaissance.” explained Ahmed Salim. “The discoveries made by men and women in Muslim civilization — from automatic machines and medical marvels to astronomical observations and inspiring architecture — have left their mark on the way we live today.” he added. 1001 Inventions takes visitors through the works of scientists and scholars during the Golden Age of Muslim Civilization, while Arabick Roots reveals the influence of this science on the scientific revolution and lifestyle in Europe in the 17th century through showcasing magnificent objects and priceless manuscripts. 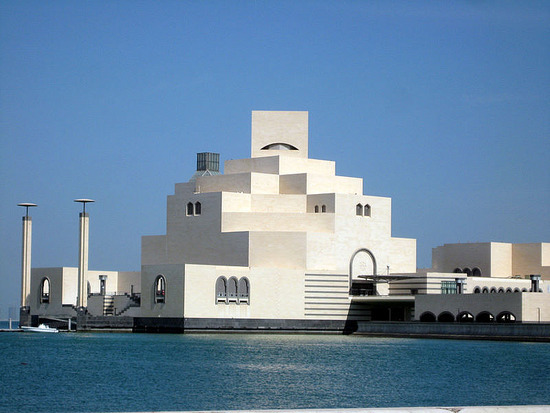 The science heritage exhibitions were brought to Doha by Qatar Museums Authority and the Museum of Islamic Art, and in partnership with Qatar Shell. “The themes of these two exhibitions, science and education, are an integral part of Shell’s social investment programme here in Qatar and support the social development pillar of the Qatar National Vision 2030,” added Sheikh Thani. The 1001 Inventions Exhibition celebrates the inventions and innovations from Muslim Civilisation, whose impact on science and technology can still be seen all around us today. Indeed, the experimental scientific method, the basis of all modern technological advancement, came from the work of Hassan ibn Al-Haytham a thousand years ago. Ibn Al-Haytham also laid the foundations of modern Optics, including the invention of the ‘Camera Obscura’ – the precursor to modern still and video cameras. Ibn Al-Haytham is just one of the scientific pioneers featured within both exhibitions. Visitors will also be introduced to Master Engineer Al-Jazari - inventor of the fabled Elephant Clock and numerous mechanisms that are used in every machine in the world today. They will discover how Andalusian physician Al-Zahrawi invented hundreds of surgical instruments and procedures more than a thousand years ago that are still saving lives in modern hospitals; and they will meet Fatima Al-Fihri, the young woman who founded and designed the world’s first modern University, which offered free education to men and women of all backgrounds. 1001 Inventions is a brand that has reached over 50 million people worldwide, and the exhibition by the same name is now open in Doha and showcases these and many more discoveries from the Golden Age of Muslim civilization - including, the first modern university, magnificent time telling machines, surgical tools and mechanical devices, and unveils the cultural and historical context of these discoveries. The 1001 Inventions exhibition showcases the influence of the Golden Age of Muslim civilisation on the Renaissance. But much less has been written about eastern influence on the scholars of 17th-century Europe. At this time, Europeam scholars were rejecting the ways of their predecessors. They promoted a ‘new philosophy’ that relied on mathematical demonstration, proof and experiment instead of theory and logic alone. The new scientific revolution sprang from this successful approach, led by scholars like Descartes, Boyle, Newton and Halley. In this enlightened period, Europe was at an intellectual advantage over the East. The Muslim world was then producing less and less original science, and it might seem safe to assume that Europe’s ‘new philosophers’ would simply reject ancient knowledge. But nothing could be further from the truth. Evidence now shows that the 17th-century scholars of the scientific revolution appreciated and built on ideas from other times and places and honoured their pioneering predecessors. Arabick Roots was inaugurated by Her Highness Sheikha Moza Bint Nasser, Chairperson of Qatar Foundation for Education, Science and Community Development, at its premiere at the Royal Society in London last year. The Doha version of the exhibition was specially adapted for the Qatari audience through a collaboration between 1001 Inventions and the Museum of Islamic Art. Through its award-winning educational programmes, books, blockbuster exhibitions, live shows, films and learning products, 1001 Inventions showcases the contributions of inspirational men and women of different faiths and cultures in a civilization that spread from Spain to China. For further information about the 1001 Inventions initiative, images, video etc. please contact us.